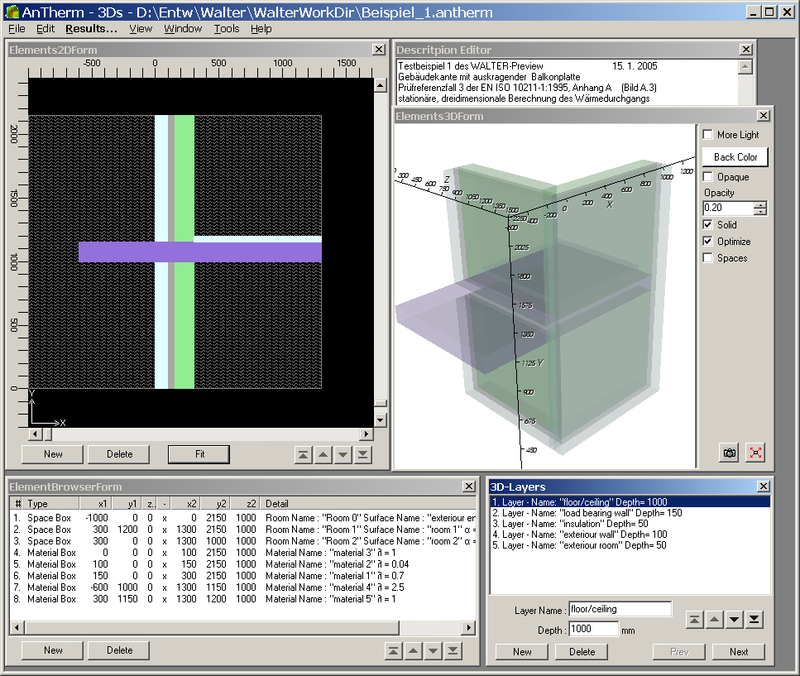 The main window provides the primary working area for all control elements of the application. While working the application the control is performed by using the main menu and various editing, dialog or evaluation windows. On each application use its windows will be shown at their latest positions. On the absolutely first start of the application its windows will be shown at some tentative positions on the screen - as defined by a pre-installed template. Windows can be freely moved and sized. This allows adjusting the layout according to user's needs. During application shutdown current windows positions are saved along with other application settings. The main window's title bar displays the name of the currently open project file - if the file name has been assigned already - together with the indication of project's type (2D, 3DS, 3D). Depending on the project type of a new, opened, imported or converted project the application will automatically expose primary editing windows suitable for the project type and/or it will dispose (close) all windows which are not useful for that one project type and processing stage. When a valid AnTherm project file is dropped onto the surface of the main window (after being dragged out from the windows file explorer) that file will be opened (equivalent to main Menu File->Open...). The name of the file will not be added to the Most Recently Used List unless the Shift- or Control-key is held depressed during the drop operation. Remark: Dropping of a Waebru component file is also supported.